It’s that time of year when things are starting to bloom and grow. It’s also the time that certain burrowing pests like ground squirrels, moles, and gophers become more active. Ground squirrels hibernate in the winter and emerge in the early spring to reproduce and go on an eating spree. If you have a garden or have any sort of landscaping on your Temecula property, ground squirrels can wipe it out in no time if left unchecked. They feed on shrubs, vines, tree bark, and they especially love plants in the seedling stage. Not only that, but their burrowing can also cause extensive damage. If they burrow too closely to tree roots, the roots can dry out, which can kill even a large, mature tree. If they burrow under the foundation of your home or other structure, they can cause structural damage, which can be expensive to repair. Another reason to get rid of ground squirrels is because of their tunnel entrances. They are typically about four inches in diameter, and create a very real tripping hazard that can lead to twisted ankles or other injuries to you, your family, or your pets. Fences don’t keep ground squirrels out, even if you bury a protective barrier several feet deep. Repellents are also ineffective. So unfortunately, ground squirrel prevention is difficult, if not impossible. Toxic bait is one of the best ground squirrel elimination methods. To eliminate them from your property, bait stations are strategically placed where ground squirrels feed. Gophers are active year-round, though you typically only see the telltale mounds of dirt they produce in the spring, when the ground near the surface is softer. They feed on roots and the fleshy parts of plants, and can pull entire plants into their tunnels. Moles, on the other hand, largely feed on insects and worms. They will occasionally eat the roots of plants or bulbs, but for the most part, the damage they cause to vegetation occurs as a result of their burrowing. When moles burrow too closely to roots, plants can be dislodged or their roots can dry out. To eliminate gophers and moles, you need to go to the source of the problem. We use effective baiting methods to eliminate gophers and moles and to keep infestations from recurring. 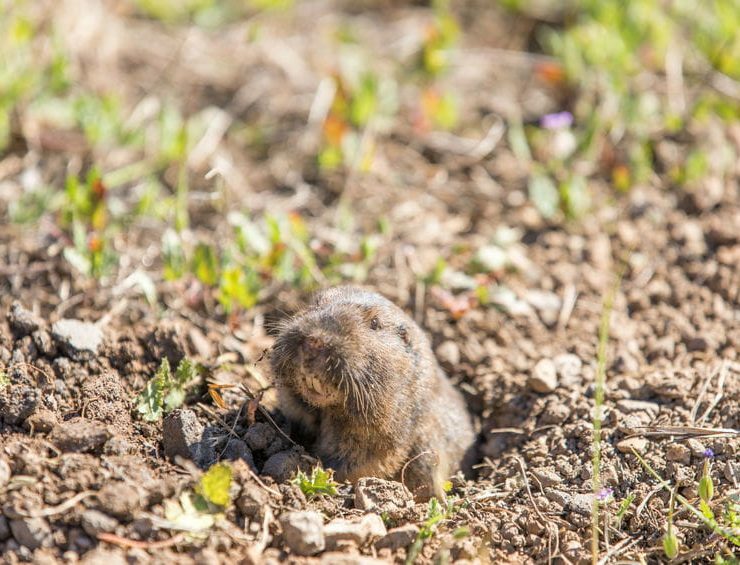 If you have a problem with burrowing pests like ground squirrels, gophers, or moles, don’t wait to call someone out for help. The pest control technicians at Knockout can help you get the problem under control quickly, using effective products that are not available in retail stores. Contact us today for a free inspection, where we can give you a pest control plan based on your specific pest problems.